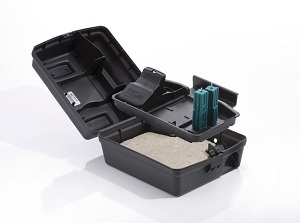 The Protecta Evo Express is a weighted, ready-to-go, tamper-resistant bait station that comes fitted with a concrete block for easy servicing and secured placement. Now, technicians don�t have to glue the bait station to a patio block or secure it to the ground. If they want, however, holes in the base of the station let them anchor it to the ground with a duckbil. In addition, two holes on the side of the station will accommodate a chain or other device for securing it to a fence or pole. Its heavy-duty removable tray is pre-formed to hold a variety of baiting options: two T-Tex Rat Traps, two Mini-Rex Mouse Traps or a combination of traps and bait. The station is equipped with four baiting rods that hold eight 1-oz. blox. The tray also lifts out for easy servicing and, once inserted, the bait rods won�t fall out when cleaning the tray. A bar code installed inside the lid is compatible with pest management software to track servicing. A service card can also be placed in the service card slot inside the station or affixed on the outside.